When comparing Italy to other European countries that offer medical courses in English, it becomes clear that the tuition fees in the Public Italian medical schools (400-4000€ /year) are nowhere near the 9000+€ that one would pay in eastern European (Hungary, Slovakia etc) or even more in UK / US medical schools . The University gets some degree of freedome to establish their fees but as a rule they are kept the same for European, Italian and non-European students. Those prices are possible because the public Universities are partially government founded. That makes Italy one of, if not the brightest example of financially accessible higher education for all. The other important component is the living expense, which is mainly composed of housing rental, food and transportation costs and eventually books. The prices can range quite a bit between the cities but one can expect to cover a month with some 500-1200€ which depends on the city size and location. As a rule of thumb, the bigger the city the more expensive it usually is and also Northern cities tend to be more expensive than southern but also more developed in terms of roads, airports and various services. Be aware that the first year can begin with up to twice as high expenses because you will need to pay security deposits for rent (usually 3 month rent worth), new stuff for your home and finding the best place to do groceries. You can browse the various universities to get a better idea or compare them side by side. Likely also students who come with average or below family-economic background can find a variety of options to finance their studies. One option I NEVER saw in my 6 years in Italy is someone taking a student loan probably because the options are sufficient enough. Scholarships The easiest step to begin with is to apply for a scholarship. 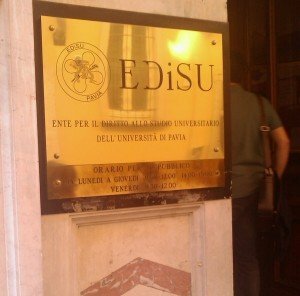 In Italy scholarships are government funded and are centrally provided via the “EDiSU” offices which are spread all over the country. There are thousands of scholarships allocated to each university and are given to students based on their family income, size and academic achievements of a student. Be aware that having a degree in any field or repeating a study year will automatically disqualify you from getting a scholarship. The scholarship can be up to 4800 Euro / year per student and include free meals in Canteen/Cafeteria , cover College/Dorms expenses, tuition fees and eventually payed in cash. Work Also foreign/non-European students are allowed to work in Italy with their student visa / stay permit. Those stay permits are officially limited to half-stake jobs (up to 20 hours/week). Part time jobs are generally available in bars, hotels, cafes but one must take into account that they are hard to find during the first years also because the lack of Italian knowledge. Take into account that some cities, usually more southern and smaller towns tend to have more problems with unemployment, so it is also something to check when you chose your future city. Universities themselves often offer mini-jobs for students. Those can include lesson tutorship, libraries, labs, university offices etc and require usually several hours a week. You will need to apply to those “Tutorati” via the University offices once those applications take place. To compete for them one needs to have better marks than the rest and show some competitive advantage in their CV. Loans The Universities and associated bodies also offer student loans which are usually of few thousands Euros and are more suited to pass a “rough period” rather than financing the whole 6 years of medicine studies. As a friendly advice, make sure you have enough savings or financial support from home for at least the first year or two. First years are full of expenses and although all the options above are helpful, during your first years there are enough things to take care of and not having to think at least about the money for a while helps a lot to get you started right.